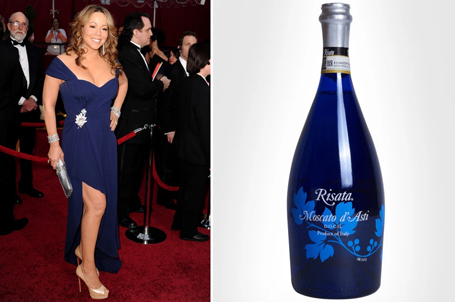 Mariah Carey has been immortalised in a series of side by side compositions comparing some of her most note-worthy outfits to Champagne bottles. Superfan Chris, who goes by the Twitter handle @extrapettychris, gave the singing legend the ultimate "pops" with the thread. In the tweet titled "Mariah Carey as Champagne bottles: a thread" the Twitter user went to great lengths to match the diva's outfits perfectly. And such a work of art deserves recognition, not least because Mariah also went out of her way to tweet her dedicated follower. The singing power house tweeted the thread and wrote: "Oh dear, here we go again." In one of the thread's many hilarious photos, Chris has taken a diamond encrusted bottle of Dom Perringon and turned it upside down to look more like Mariah's pose. In another, where Mariah wears a camo-print outfit, her follower has removed part of the bottle to make it look like - you've guessed it - camouflaged. Some of Mariah's most memorable outfits are in the mix, including her Heartbreaker single cover and the gold dress she wore for a concert at New York's iconic Beacon Theatre in 1998. Fans of the singing superstar were thrilled by the thread and flooded the Twitter user's account with heartfelt congratulations. One wrote: "Congrats dahling, she noticed you." While another added: "Ha thanks bae. This thread is everything."